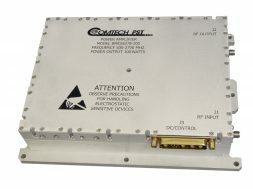 Model BPMC928109-1000 is a GaN amplifier for applications in the X-band radar market. The AB linear design operates over the 9.2 to 10.0 GHz frequency range. Its design features options for control of phase and amplitude to allow for integration into high power systems utilizing conventional binary or phased array combining approaches for power levels of up to 10kW.